Represents the object class configuration options of the Object Identification dialog box. CreateUserDefinedObject Defines and returns a new, user-defined object, which is mapped to the standard Windows class of the object in the statement. 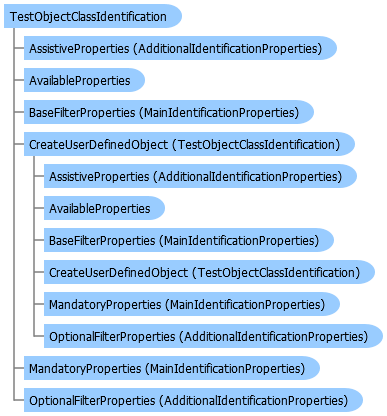 AssistiveProperties Returns the collection representing the list of assistive properties from the Object Identification dialog box. AvailableProperties Returns the collection representing the Object Identification Add/Remove dialog box, which enables you to modify the list of properties in the mandatory, assistive, base filter, or optional filter properties lists. BaseFilterProperties Returns the collection representing the list of editable base filter properties from the Smart Identification Properties dialog box. EnableSmartIdentification Indicates whether to enable or disable the smart identification mechanism. MandatoryProperties Returns the collection representing the list of editable mandatory properties from the Object Identification dialog box. OptionalFilterProperties Returns the collection representing the list of optional filter properties from the Smart Identification Properties dialog box. OrdinalIdentifier The ordinal identifier property for the test object class.